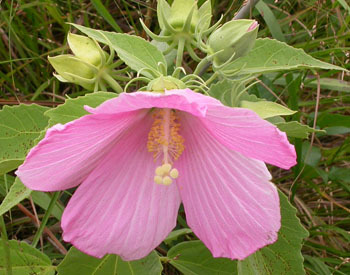 Rose Mallow, Hibiscus palustris. Photo by Kris Henricksen, click to enlarge. Tuesday, June 26, 5:00 pm at the Wakeman Center. Join us for our 47th Annual Meeting of the Board and Membership. 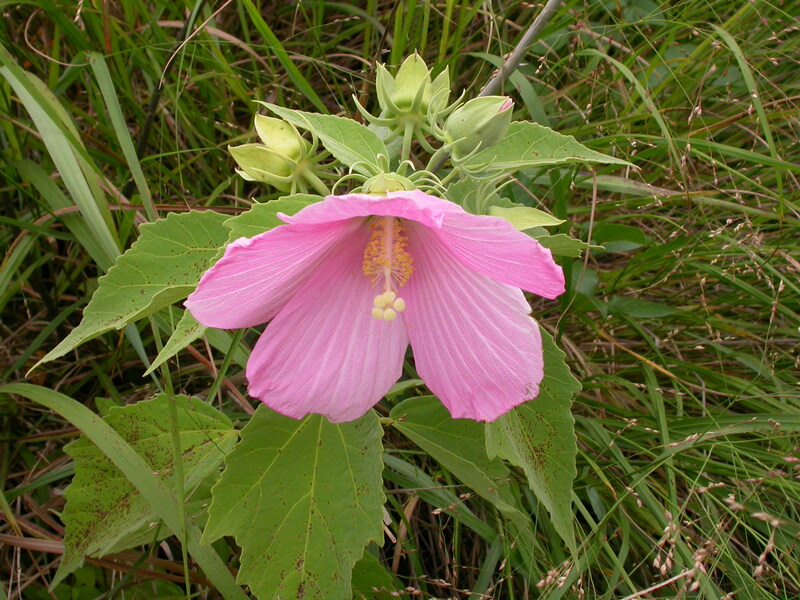 This year's meeting features a presentation by landscape designer and native plant specialist Kristin Henriksen. Kris will address lawn and landscape care that nurtures native plant species and protects natural resources like our coastal ponds. All are welcome. FREE. For more information, see our events page. Friday, June 15, 8:00 pm, at the Katharine Cornell Theatre. Admission to the screening is $8 ($5 for MVFS and VCS members and children under 14). For more information, and to watch the trailer, see the film's website. 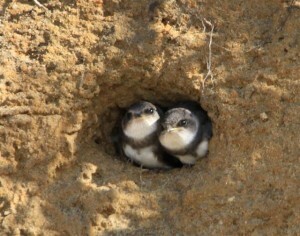 Bank swallows at Lucy Vincent beach. Photo by Lanny McDowell. Wednesday, Jun 13, 5:30 pm, at the Chilmark Library. Learn about beach- and cliff-nesting birds with wildlife biologists Luanne Johnson and Liz Baldwin and possibilities for participating in surveys. Free. Call 508-645-3360, or see website. Mondays, Wednesdays, and Fridays, 10:00 to 11:30 am, Felix Neck Wildlife Sanctuary in Edgartown. Meet amazing creatures of the sea including crabs, whelks and scallops! Take a short walk through the forest to a protected beach,where you will explore shallow waters with dip nets and use a large seine net. Wear clothes and shoes that can get wet, and don't forget your hat, sunscreen, and mosquito repellent. All ages, $9 ($6 for Mass Audubon members). For more info, call (508) 627-4850 or see website. The Farmer's Market is Back! at the Grange Hall, West Tisbury. Fresh picked produce from local farms, flowers, delicious baked goods and prepared foods from Island kitchens and more. After this Saturday, the market is open both Wednesdays and Saturdays through August (Sat. only afterward). Saturday, June 16, 10:00 to 11:30 am, at the Polly Hill Arboretum. Botanist Arthur Haines discusses his book Flora Novae Angliae, explaining why the recent update was necessary and sharing his stories of plants, places, and people important to him in the creation of this invaluable new manual for botanists, students, and horticulturists. $15/$10 for PHA members.For details, see website or call 508-693-9426. If you can't get local eggs from free-roaming chickens (though, this time of year the only excuse would be that they're sold out), consider replacing the milk with heavy cream buttermilk. That should help replace some of the missing richness of real eggs, which comes from the chickens' special (that is, wild) diet. Mix dry ingredients in a large bowl, then cut in butter until mixture resembles coarse crumbs. Slice the strawberries and then gently mix them in just enough to be coated in flour. Add one egg and the milk, and separate the other egg, adding the yolk while reserving the white. Mix until blended, trying not to crush the berries. Drop dough onto a lightly floured surface and knead delicately until the dough comes together. With floured hands pat dough into a 1/2 inch thick circle. Transfer to a parchment paper lined baking sheet and with a sharp knife, score dough into 12 slices. Brush top with reserved egg white and sprinkle with sugar. Bake in preheated 425°F oven for about 20 minutes. Serve warm. Adapted from Lynne Bouchard's blog. Considering its overall length, California has one of the most armored coasts in the world. With its history of beachfront building and the resulting valuable – but increasingly threatened – property to protect, approximately 10% of its coast is now physically fortified in one way or another. Recently, though, in recognition of the damage done by seawalling (both in the longer-term, and broader-scale), the state is changing its response to coastal erosion. A recent piece in the Boston Globe describes these changes in California and elsewhere. As sea level rise and coastal storm frequency continue to increase in the wake of global climate change, the pace of coastal erosion will quicken in many places, making these sorts of decisions – hard armoring, managed retreat, or some sort of middle path – all the more urgent. An important component of this reduction must come from improved usage of organic waste. One promising option is the use of anaerobic digesters to create biogas, a mixture of mostly methane and CO2 that is produced by the breakdown of organic material – food, lawn clippings, manure, etc – in the absence of oxygen (thus “anaerobic”). The first of these in the state currently sits on a dairy farm in Rutland and should be operational in a few weeks. Though methane itself is a potent greenhouse gas, the impact of burning it for energy production is more complex. Methane (aka natural gas) combustion releases a substantial amount of CO2 into the atmosphere, but less than other carbon-based fuels such as coal and oil. Further, in this case the capture of methane using digesters and conversion to CO2 during energy production seems clearly better than the present situation, where organic waste decomposes in landfills and releases its methane directly into the atmosphere (along with more noxious gases, due to sharing space with general garbage containing heavy metals and hazardous chemicals). Jeremy Seifert's muckraking documentary rests on a sad and jarring fact: each year, Americans discard around 96 billion pounds of edible food, and send it directly to landfills - when hundreds of countries around the world exist below the poverty line. In Dive!, Seifert and co. go "dumpster diving" in the back-alley receptacles of L.A.-area supermarkets. During their journey, they manage to retrieve thousands of dollars worth of decent food, which raises vital questions about why such waste continues to occur, while numerous overseas populations starve. No, dumpster-diving is not a serious solution to the problem of local, let alone global, food waste and disposal. To perhaps take it too seriously for a moment, it lacks scalability: no affluent, food-wasting community contains enough people who are simultaneously physically fit and hungry (both literally and figuratively) enough to clean up after everyone else in that manner. And of course, we still need infrastructure that can reprocess the less tasty-looking components of our organic waste. But what Dive! does is vividly illustrate just how wasteful our society has become, by calling attention to how much we throw away that is so easily repurposed without the need of heavy industry. Locally, we are doing better than most. Our farms are not so large that they can’t find a way to make good use of organic waste: unsalable vegetables and chaff go to the compost heap, or become healthy forage for pigs and chickens, while manure is used for fertilizer, rather than being fed to other livestock (and then, from that animal’s manure, back to the original species). Also, several Island restaurants have begun separating food waste and realizing savings in disposal costs (see this section of the VCS Recycling Survey report). But there is certainly more that can be done locally, from encouraging (or requiring, as the proposed state regulations would do) all restaurants to get on board, to expanding the options for collecting residential organic waste. VCS is in the preliminary stages of planning a seminar this fall to discuss the new state regulations, composting equipment, and local possibilities for funding and implementation. Stay tuned! The Dutch company Spranq received a decent amount of press in the environmental pages in 2008 when it released its first “ecofont,” a hole-riddled version of the common sans-serif Verdana. The font, which is still available as a free download on their website, saves printer ink by taking advantage of a basic human perceptual skill: our brains will fill in the details around what our eyes don’t see. Since then, the company has developed a complete software package (for purchase) that can run alongside your other programs, improving ink efficiency for all sorts of fonts and documents.